Fact: 70% Will Miss Out on a Selective School Offer. Will your child get high scores to get into a Selective School like Melb High, MacRob, Nossal or Suzanne Cory? What is the Victorian Selective Schools Test & How to Prepare Your Child for It? It is long perceived that selective schools provide students with excellent education without the exorbitant fees normally found in private grammar schools. Selective schools are public schools. There is $0 tuition fee but the a school may ask for a voluntary contribution which you pay if you want to. These usually range from $500 - $2000. As a former MacRobertson Girls High School student, I can say that the school is life-changing. My friends who went to the school have become surgeons, doctors, dentists and lawyers. So more importantly, how can your child get into one of these selective schools and how can YOU help set them up for a secure and successful future? The answer is simple. To get into Melbourne High, MacRobertson Girls' High School, Suzanne Cory and Nossal, your child needs to ace the Victorian Selective Schools Entrance Exam held in June each year. To help your child gain a school offer, you should get help for your child to prepare for the test. With over 3,000 students trying to get a school spot – the competition is fierce. The reality is that there are students who already know VCE level mathematics when they’re in Grade 8. The reality is that there are some students who prepare for the test 3 years in advance. When so much is on the line, it makes sense to get help. You can see that sometimes, the difference between getting a spot and missing out is by getting an “average” in just one subject. EVERY part of the test counts – you can’t just expect superior maths skills to get you through. The whole test counts. Also, you can’t rely on your child’s school scores to get a free pass into the school. Just because your child gets good marks at school doesn’t mean that they’ll score well on the test. School marks can differ wildly and an “A” with one teacher could be a “C” for another. Past exam candidates have relied on their school marks only to end up disappointed when they get the rejection letter. You need expert test preparation and Exam Success gives you that. What’s in the Victorian selective school test (test format, number of questions and time limit)? Word that has the closest meaning to another word. Adding or removing a letter to make a different word. Logical consequence based on a statement. Your child will be asked to write a narrative piece or a persuasive piece based on a prompt. For narrative writing, your child will be tested on their ability to come up with a story that is related to the prompt and communicate that story. This demands more than the ability of your child to recall grammar rules and know the basics. They need to use the basics in a way where they can communicate and tell a story. They need to extend their application of the basics to enhance their expression. They need to write a story that progresses in order and have a beginning, main event and ending. For persuasive writing, one of the most important things for your child to do is to select a stance or position. They then need to persuade the reader to agree with their stance. Like creative writing, at this level, it is expected that your child will know basic grammar and spelling and the focus here would be on how well they can communicate. This includes writing according to the genre (not confusing it with informative or discussion writing) and writing according to the prompt. Because this time limit is longer than previous (it used to be 15 minutes per piece), students are expected to go more deeply into their topic or storyline and our suggestion/guide in terms of length is to write around 500 words. Students are asked to read or review a variety of media from non-fiction texts like interviews and articles to fiction texts like narratives. Students are asked to answer questions based on texts presented. The Edutest reading test sometimes includes requests for students to select the grammatically correct sentence or interpret a quote. While ACER tests (another exam setting body) focus on mathematical reasoning, Edutest exams have been reported to be more ‘straightforward’. The exam can test equations and also content that many students may not have been exposed to at school already. Such things are Pythagoras theorem, surds and more. ﹡ The number of questions and time limit have been taken from the Victorian State Government Education and Training website. Please note that the authoritative body can change the number of questions and time limits from year to year so please refer to their websites for the most up to date information. Time per question is calculated by taking the time limit divided by number of questions. Find out how your child can prepare for all 6 parts of the Victorian Selective Schools Entrance Exam. 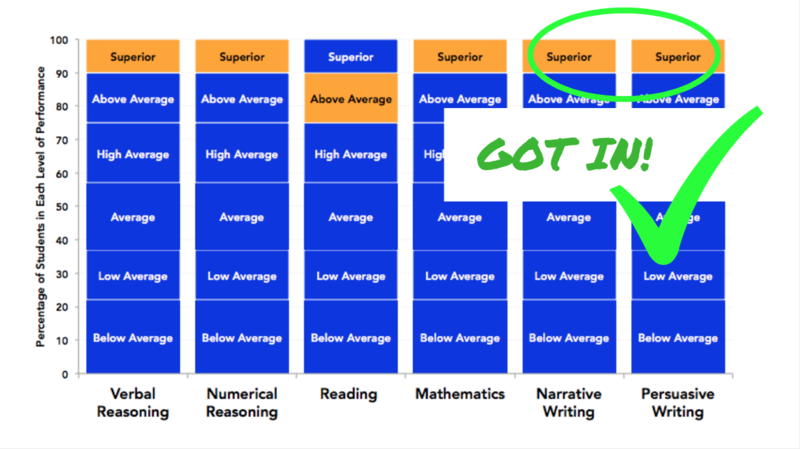 How can your child get “above average” or “superior” scores (and get a school offer)? Many parents ask me this question. For writing, it’s about getting practice and feedback. 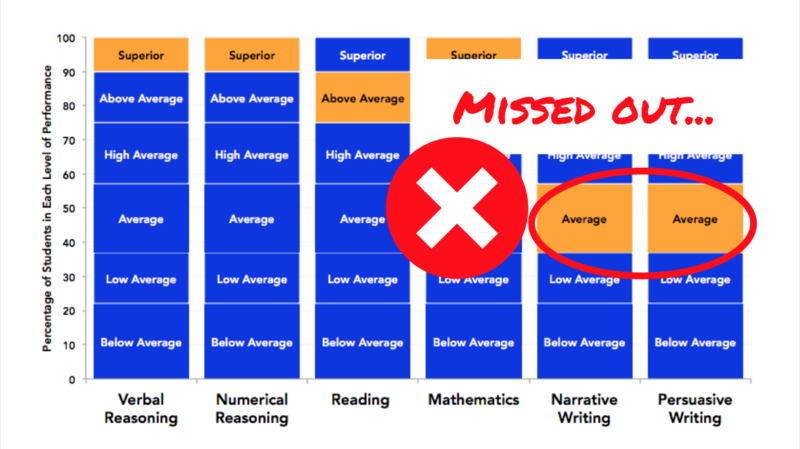 In my experience, sometimes students have missed out on a high writing score because the ordering of their writing was confusing or they used too many ‘fancy’ words that weren’t needed in the story. This leads to “average” marks (even if you write clear sentences with perfect spelling and punctuation). Once this was fixed up (through feedback), their writing transformed from “average” to “superior” and they got into a selective school (and some even got offered scholarships!). But feedback shouldn’t be done by anyone. Through Expert Writing Insights, we use a 52-point scoring tool to provide your child with feedback on their writing and whether it is competitive or not. Here’s an example of Expert Writing Insights being used on an essay. For multiple-choice questions, it’s about practice (again) and filling up knowledge gaps and creating strategies to help your child cope with different question and deal with them in a time-effective way. These strategies are available in my online courses. See expert programs your child can start now! As a minimum, per course there are 10 questions x 10 checkpoints = 100 questions (some courses/checkpoints have more). The final checkpoints (Checkpoint 11 / 12) is the practice exam which has for the Year 7 exams, approximately 30-45 questions depending on the course and for Year 9, this is 50-65 questions depending on the course. The course should provide all the practice questions you require in order to prepare effectively for the exam.Parents don't often realise that too many practice questions is not a good thing because students are more likely to skim over the question and 'do it' and opposed to understanding the logic more deeply. Understanding the logic leads to Exam Success!I've seen this problem happen a lot where parents buy all this practice material and become confused and stressed not knowing where to start! Focus on quality of practice questions over quantity and your child will be less stressed, more focused and better prepared for the exam. It's about studying smarter not harder! If I wish to purchase whole package, how much time (approx.) should it take for my 13yr old to complete all the units? Yes - that's what we wanted as students often have to reinforce their knowledge. You can revisit the unit whenever you like. It's like having the ultimate text book in video format and you can flip ahead or back whenever you need. Access is granted for a period of six months. If you need an extension it is $19 per month for an individual course or $39 per month to have your whole package extended per month.No the videos cannot be downloaded, everything is available to access on the site.